Our goal is to help you get from one place to the next in one of our modern vehicles. Our fleet of brand new Low Speed Vehicles are the perfect way to navigate the city of Cape May. Able to travel on roads with speed limits 35mph and below, our LSVs are great for visiting the light house, our local winery or a night on the town. 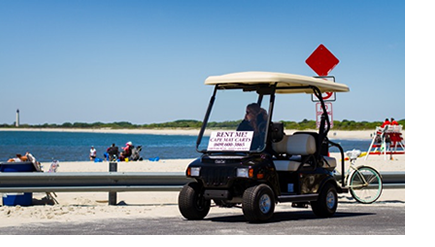 Cape May Carts, town's only Low Speed Vehicle Rental opening May 2015, will cater to the island of Cape May renting out "street legal golf carts" or "low speed vehicles." Get a chance to see the town, travel to the beach, lighthouse, winery or check out the victorian homes. We can do pick up and drop offs or you can come get one from our West Cape May location. Our vehicles are made by Club Car and plug right in to a normal outlet to charge. They are fun and exciting to drive. We hope everyone is as excited as we are to check us out!